Total Diamond Equivalent Weight (DEW) 0.50 carats. The absolute best. 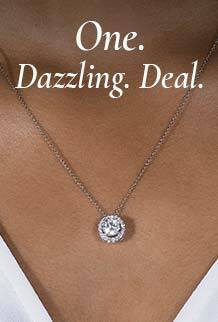 This Forever One pendant necklace has a endless circle of round cut stones. Set in 14K gold, this necklace is an expert at catching the light and drawing attention. The perfect accessory.